Westringia (Westringia spp. ): growing, planting, caring. A small Australian shrub and a member of the mint family. Scientific name : Westringia spp. Full description for Westringia spp. not yet available. You can't recognize it by smell, it does not smell rosemary. It is a shrub with rounded port, erect branches, around which are planted opposite leaves. These vary according to the species, they are thick, greyish, sometimes hairy, linear to oval. The flowers are typical of lamiaceae, with two lips. They are spring or summer flowers, pink to white. You can grow Coast Rosemary in pot, or outside in the region with mild winters! Outside, plant in very drained soil, in full sun. Be careful, if your soil is calcareous, you will need to add heathsoil to the plantation. Make a 20/30 cm planting hole, wider than the root ball, and if your soil is heavy, plan for 20 cm of gravel at the bottom of the hole. Empty two watering cans in the planting hollow that you have shaped for this purpose. In pots, plant in a large pot pierced at the bottom (5 liters or more), with a cup, in a mixture of potting soil or very ripe compost, on a layer of gravel. Water after planting. 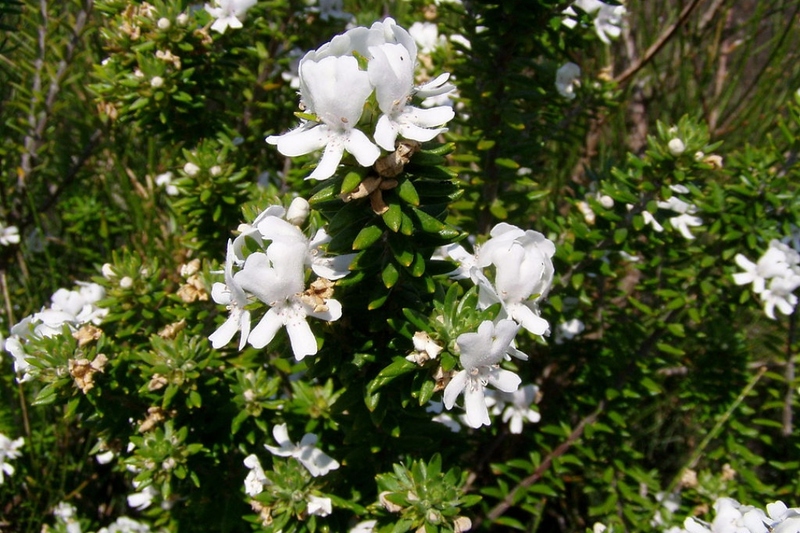 Coast Rosemary prefers well-drained soils and fears excess moisture, which can be fatal. If yours is in open soil, no need to water it except in case of severe drought. In pots, water on average once a week, with non calcareus water. After a few years in the same pot, your Coast Rosemary will appreciate that you renew a portion of its land, or even that you provide a larger container. Remove it from its pot by holding it at the base of the trunk. If it seems blocked, cut the roots that have passed through holes in the bottom of the pot. Provide a new mixture of heathsoil and sand.